Principle Scientist at the Centre for Global Health, the Institute of Population Health, and the C.T. Lamont Centre for Research in Primary Care, and is Associate Professor in the Department of Family Medicine and the Department of Epidemiology and Community Health at the University of Ottawa in Ontario. Objective To identify and prioritize innovative strategies to address the health concerns of vulnerable migrant populations. Design Modified Delphi consensus process. Participants Forty-one primary care practitioners, including family physicians and nurse practitioners, who provided care for migrant populations. Methods We used a modified Delphi consensus process to identify and prioritize innovative strategies that could potentially improve the delivery of primary health care for vulnerable migrants. Forty-one primary care practitioners from various centres across Canada who cared for migrant populations proposed strategies and participated in the consensus process. Main findings The response rate was 93% for the first round. The 3 most highly ranked practice strategies to address delivery challenges for migrants were language interpretation, comprehensive interdisciplinary care, and evidence-based guidelines. Training and mentorship for practitioners, intersectoral collaboration, and immigrant community engagement ranked fourth, fifth, and sixth, respectively, as strategies to address delivery challenges. These strategies aligned with strategies coming out of the United States, Europe, and Australia, with the exception of the proposed evidence-based guidelines. Conclusion Primary health care practices across Canada now need to evolve to address the challenges inherent in caring for vulnerable migrants. The selected strategies provide guidance for practices and health systems interested in improving health care delivery for migrant populations. We used a modified Delphi technique24,25 to generate, prioritize, and achieve consensus on the most critical practice strategies needed to improve primary health care for vulnerable migrant populations. Before starting the consensus process, we conducted a scoping literature review and consulted key informants from the Canadian Collaboration for Immigrant and Refugee Health (CCIRH) to identify promising practice strategies. The CCIRH is a national collaboration of more than 150 primary care practitioners, immigrant community champions, researchers, and program and policy planners dedicated to improving the health of immigrants and refugees (www.ccirhken.ca). This initial literature review and consultation process identified 13 practice strategies relevant for primary health care. We developed priority-setting criteria aimed at addressing inequities in primary health care delivery using a multi-criteria decision-analysis approach.26 The criteria sought to identify effective interventions in primary care settings and organizations, evidence-based practices that considered sociocultural factors, and equitable access and use of primary care services, as well as practices that might influence future comprehensive health system policies. We purposively selected 41 primary care practitioners, including family physicians and nurse practitioners working with migrants in various centres across Canada, aiming to select practitioners with in-depth experience with various migrant populations. Participants were primarily recruited from the CCIRH Health Knowledge Exchange Network. In the first round of the Delphi ranking, we asked participants to rank the identified practice strategies from 1 (highest priority) to 13 (lowest priority). To ensure our list of strategies was comprehensive, we invited participants to propose additional practice strategies. We chose a priori a rank average of 5 or less to acclaim the top 3 strategies. In the second round, we included an additional 5 items that were frequently suggested by practitioners as potentially effective strategies together with previously ranked items in order to select 3 more strategies. After the second round, we reviewed our ranked priority strategies from round 2 with 3 international migration health experts in an effort to confirm the consistency of our results with findings from other regions. We also used these consultations to help craft our definitions and to remain aware of variations in nomenclature in relation to innovative strategies. For the third round, which prioritized the most highly ranked strategies thus far, we included detailed definitions for each item and had participants rank the list of items, including the top 3 strategies that had already reached consensus. We used an average score for each item to rank the strategies in each round of the consensus survey. A cutoff score of 3 was used for acclamation. 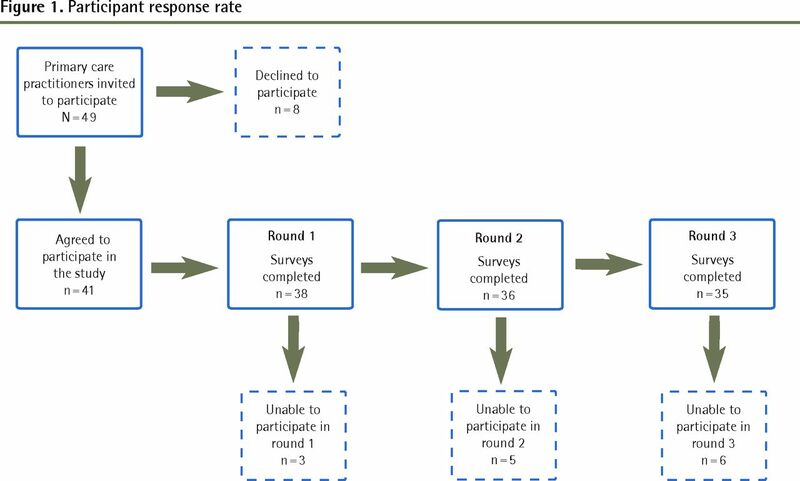 Each round consisted of e-mailing participants an explanation of the process to date, the priority-setting criteria, instructions for filling out the survey, and a link to the online survey (www.surveymonkey.com). We used Microsoft Excel for the analysis of the results. Ethics approval was obtained from the Ottawa Hospital Ethics Board and the University of British Columbia’s Behavioural Research Ethics Board. Participants represented 8 of the 10 Canadian provinces, but half of them came from Ontario. Most described their clinical settings as urban or inner city (Table 1). In this group, most respondents were women and more than two-thirds had more than a decade of clinical experience. All had academic expertise or local leadership roles and all of them demonstrated ongoing clinical commitment to migrant populations. Demographic characteristics of the Delphi panel: N = 41.
evidence-based guidelines for clinical practice. First-round ranking results of the initial list of innovative practices that was developed based on literature review: Options were rated from 1 (highest priority) to 13 (lowest priority). Top ranked items from second-round ranking, including additional list of innovative practices: Options were rated from 1 (highest priority) to 15 (lowest priority). Third-round, final ranking: Options were rated from 1 (highest priority) to 6 (lowest priority). In our work there was a clear consensus on the need for interpretive services for community-based primary health care. Language barriers can negatively affect access to primary health services and can lead to serious health consequences.26,28 In Europe, the top recommendation was improving access to care, the United States recommended hiring and promoting minorities in the health care work force, and Australia, which has a national telephone interpretation program, recommended migration entitlements (Table 6).16,18,20 Two basic approaches have been suggested to address barriers caused by the lack of a shared language between patient and practitioner. The first is to match patients with practitioners who share the same language. The second is to provide some form of interpretation.29 Different models of interpretation services include untrained (family) interpreters, professional interpreter services (community or hospital based), and third-party telephone interpreter services.30 The cost of interpretive services varies considerably from in-person interpretation to telephone interpretation.30 Some of the Canadian experts noted their hospitals had recently received funded access to interpretation services, and the decisive ranking suggested that it was a priority to scale up access to such services across Canada. Other prioritized strategies included intersectoral collaboration, and community engagement and support. These 2 strategies have been widely recognized as essential to addressing the social determinants of health.37,38 Abundant research has pointed out the prominence of social determinants in immigrants’ health transitions, emphasizing the role of living conditions and individual behavioural factors that affect peoples’ lives, while minimizing the value of appropriate health care. These priorities reflect an important and integral perspective of the panel on the notion of how to act in improving the health of vulnerable immigrants. Few primary care practices have implemented any of these strategies; consequently, the prioritized list represents a recommendation to improve the health system across Canada through implementation of these strategies into primary care practices. Using practitioners to select strategies ensured both that the needs of opinion leaders were heard and that the strategies they viewed as most needed were prioritized. But in working with perceived needs of practitioners, we risked a reporting bias: overemphasizing strategies that were needed for specific refugee populations, or strategies that were needed for specific regional health systems. To mitigate this bias we used a panel of international migrant health leaders. The inclusion of migrant health experts who might have been involved in or at least aware of the evidence-based guidelines for immigrants and refugees8 might have biased the results toward selecting guidelines as a practice strategy in Canada. Comparisons of recommended practice strategies across countries might be limited because of differences in local contexts, differences in the perspectives of the authors or respondents, or differences in the breadth, definition, and scope of the interventions described. The implementation of effective practice interventions and strategies continues to require greater conceptual clarity and consistency of language. We hope our work contributes to the international consensus building around strategies for migrant health and builds on the evidence-based efforts of groups such as the Cochrane Effective Practice and Organization Care Group. Canadian primary health care needs to evolve to address the challenges of vulnerable migrant populations. Our selected strategies provide guidance for practices and policy makers interested in improving care delivery for migrant populations. As migrants continue to originate from around the globe, and as migrants begin to move to smaller cities and towns, the primary health system must find ways to implement interpretation services, support comprehensive care and continuity of care, provide evidence-based guidelines, develop training for practitioners, and enable new ways to promote intersectoral care and community engagement. Immigration continues to increase diversity in many Canadian regions. The most vulnerable migrants will encounter cultural and linguistic barriers that impede trust in, navigation of, and access to primary health care. This study used a Delphi consensus process to determine what strategies to address the health needs of migrants were considered priorities by a group of primary care practitioners who provided care to this vulnerable population. Participants indicated that in order to improve migrant health care, the primary health system must find ways to implement interpretation services, support comprehensive care and continuity of care, provide evidence-based guidelines, develop training for practitioners, and enable new ways to promote intersectoral care and community engagement. L’immigration continue d’accroître la diversité dans de nombreuses régions au Canada. Les migrants les plus vulnérables seront confrontés à des obstacles culturels et linguistiques qui les empêchent de faire confiance aux soins de santé primaires, de naviguer à l’intérieur de ce système de soins et d’y accéder. Dans cette étude, on s’est servi d’un processus consensuel Delphi pour déterminer quelles étaient les stratégies visant à répondre aux besoins des migrants en matière de santé étaient jugées prioritaires par un groupe de professionnels des soins primaires prodiguant des soins à cette population vulnérable. Les participants ont indiqué que pour améliorer les soins de santé aux migrants, le système des soins primaires doit trouver des façons d’offrir des services d’interprétation, de soutenir des soins complets, globaux et continus, de fournir des lignes directrices fondées sur des données probantes, d’élaborer de la formation à l’intention des professionnels et de mettre en œuvre de nouveaux moyens pour promouvoir les soins intersectoriels et la mobilisation de la communauté.
. Migration health: embracing a determinants of health approach. Health Can Res Bull 2010;17:1.
. Migration and health in Canada: health in the global village. CMAJ 2011;183(12):E952-8.
. Responsiveness of the Canadian health care system towards newcomers. Ottawa, ON: Commission on the Future of Health Care in Canada; 2002. Discussion paper no. 40.
. Health status and health care of immigrants in Canada: a longitudinal analysis. J Health Serv Res Policy 2005;10(2):77-83.
. Access to health-care in Canadian immigrants: a longitudinal study of the National Population Health Survey. Health Soc Care Community 2011;19(1):70-9.
. Development of guidelines for recently arrived immigrants and refugees to Canada: Delphi consensus on selecting preventable and treatable conditions. CMAJ 2011;183(12):E928-32.
. Enter at your own risk: government changes to comprehensive care for newly arrived Canadian refugees. CMAJ 2012;184(17):1875-6.
. Evidence-based clinical guidelines for immigrants and refugees. CMAJ 2011;183(12):E824-925.
. Accessibility and the Canadian health care system: squaring perceptions and realities. Health Policy 2004;67(2):137-48.
. Literacy and health research in Canada: where have we been and where should we go? Can J Public Health 2005;96(Suppl 2):S62-77.
. Working (in) the gap: a critical examination of the race/culture divide in human services. Edmonton, AB: University of Alberta; 2010. Available from: http://hdl.handle.net/10048/1256. Accessed 2013 Dec 11.
. Primary health care and the social determinants of health: essential and complementary approaches for reducing inequities in health. J Epidemiol Community Health 2011;65(8):656-60.
. Innovative practices in immigrant and refugee health care in Canada; Paper presented at: 12th National Metropolis Conference; March 2010; Montreal, QC.
. Welcoming Communities Initiative: evidence review for promising practices to address local immigrant partnership immigrant health priorities. Welcoming Communities Initiative e-Bulletin. 2011 Apr.. Available from: www.welcomingcommunities.ca. Accessed 2013 Dec 11. European best practices in access, quality and appropriateness of health services for immigrants in Europe. Project report on Delphi process on best practice of health care for immigrants. Utrecht, Neth: Netherlands Institute for Health Services Research; 2011. EUGATE Project. Work Package No. 7. Available from: http://lubis.lbg.ac.at/webfm_send/99. Accessed 2012 Jun 3.
. Access to health care for migrants, ethnic minorities, and asylum seekers in Europe. Policy brief. Vienna, Aus: European Centre for Social Welfare Policy and Research; 2009. Available from: www.euro.centre.org/data/1254748286_82982.pdf. Accessed 2013 Dec 11.
. Hurdles to health: immigrant and refugee health care in Australia. Aust Health Rev 2005;29(1):25-9.
. Best practice in refugee health care. Refugee health kit. Darebin, Aust: North Central Metropolitan Primary Care Partnership, Northern Division of General Practice; Available from: www.foundationhouse.org.au/LiteratureRetrieve.aspx?ID=25035. Accessed 2014 Jan 2.
. Cultural competence in health care: emerging frameworks and practical approaches. New York, NY: The Commonwealth Fund; 2002. Available from: www.commonwealthfund.org/News/News-Releases/2002/Oct/Health-Care-Organizations-Break-New-Ground-In-The-Quest-To-Improve-Care-For-Immigrant-And-Minority-A.aspx. Accessed 2013 Dec 11.
. Health services considerations amongst immigrant populations. J Immigr Refug Serv 2005;3(3–4):15-27.
. Providing language interpretation services in health care settings: examples from the field. National Health Law Program. Field report. New York, NY: The Commonwealth Fund; 2002.
. Justin-Time/Juste-à-Temps communication and decision support for vulnerable migrant populations. Ottawa, ON: CIHR Team Grant Research proposal; 2012.
. The Delphi technique: a worthwhile approach for nursing? J Adv Nurs 1994;19(6):1221-5.
. A critical review of the Delphi technique as a research methodology for nursing. Int J Nurs Stud 2001;38(2):195-200.
. Priority setting of health interventions: the need for multi-criteria decision analysis. Cost Eff Resour Alloc 2006;4:14.
. Continuing professional development (CPD). Mississauga, ON: College of Family Physicians of Canada; 2013. Available from: www.cfpc.ca/CPD. Accessed 2013 Dec 16.
. “My health has improved because I always have everything I need here…”: a qualitative exploration of health improvement and decline among immigrants”. Soc Sci Med 2010;70(8):1219-28.
. Language barriers in access to health care. Report prepared for Health Canada. Ottawa, ON: Health Canada; 2001.
. Health care interpreter services: strengthening access to primary health care. Literature review: examining language barriers and interpreter services in Canada’s health care sector. Report supported by the Primary Health Care Transition Fund. Ottawa, ON: Health Canada; 2006.
. Policy relevant determinants of health: an international perspective. Healthc Policy 2002;60(3):201-18.
. Evidence-based medicine, systematic reviews, and guidelines in interventional pain management, part I: introduction and general considerations. Pain Physician 2008;11(2):161-86.
. Overdiagnosed: making people sick in the pursuit of health. Boston, MA: Beacon Press; 2011.
. Strengthening intersectoral collaboration for primary health care in developing countries: can the health sector play broader roles? J Environ Public Health 2010:272896. Epub 2010 April 29.
. Citizen engagement in health casebook. Knowledge translation and public outreach. Ottawa, ON: Canadian Institutes of Health Research; 2012. Available from: www.cihr-irsc.gc.ca/e/documents/ce_health_casebooks_eng.pdf. Accessed 2013 Dec 11.